At the last Fast Food Rights campaign planning meeting in London on 25 June, we decided to go for actions around the country at the end of the summer, drawing links with the incredible movement of fast food strikes in the US. Since Fast Food Rights last national day of action on 15 May, which was part of global solidarity with the biggest US fast food strikes yet, the US fast food workers’ struggle took a significant step forwards when they pulled off a country-wide convention with some 1,200 fast food workers with delegations from all over the states. Here in Britain the campaign, set up in early 2014, is getting off the ground. For example following our last day of action, 27 fast food workers joined up to the union in one city, as well as others signing up from areas across the country. In late autumn we are planning a national speaking tour with fast food workers from the US to share their experience with fast food workers here. 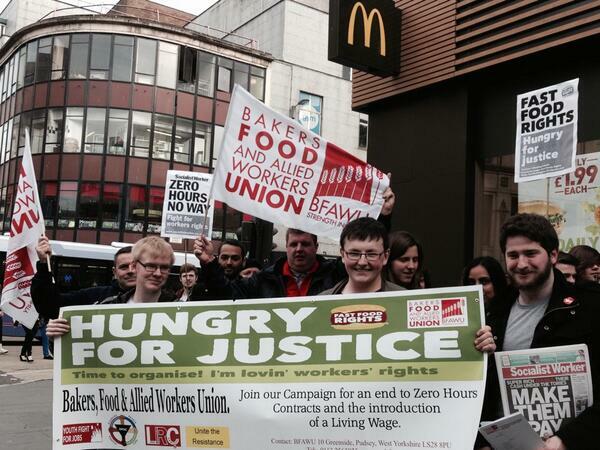 We aim to go for meetings where local Fast Food Rights groups are active. More details to follow. (venue will be confirmed shortly). At the last London planning meeting in June we discussed making Brixton, Windrush Square, a focus for the next action in London, to link up with others such as the living wage campaign by Ritzy workers. Among any other ideas people have, the meeting on 8 September will be following this up and deciding a date.